Working with horses isn’t a job—it’s a way of life. It’s something that may not be obvious when you’re enjoying a beautiful day at the races, but those in the industry know that every winning moment is powered by the hard work of countless people behind the scenes. That dedication to hard work defines the people and brands who choose to make horses their life’s work. It’s a legacy, something passed down from generation to generation. And it’s something that Keeneland, more than any other brand, understands deeply. Keeneland stands alone at the top of the industry: the only organization to combine world-class racing with world-renowned sales, driven by a mission to improve the industry. Keeneland and the Thoroughbred world are inextricably tied together—so when it came time to make Keeneland’s first national television spot, we needed to capitalize on that unique position. Founded by horsemen, Keeneland has always been defined by its relationship with the people who make up the Thoroughbred industry. By recognizing the hard, gritty, often-unglamorous work of these people—work that can go unseen or unnoticed— Keeneland could prove that it understands them better than anyone. This gave us the opportunity to forge a deep, genuine connection with Keeneland’s audiences, stand out among the clutter of other commercials, and solidify Keeneland’s place as a leader within the industry—a leader who understands what it takes to make those winning moments happen. We created an anthem to the Thoroughbred industry: a piece that would create a sense of pride in everyone who devoted their lives to the Thoroughbred, from grooms to groundskeepers to jockeys, trainers and owners. 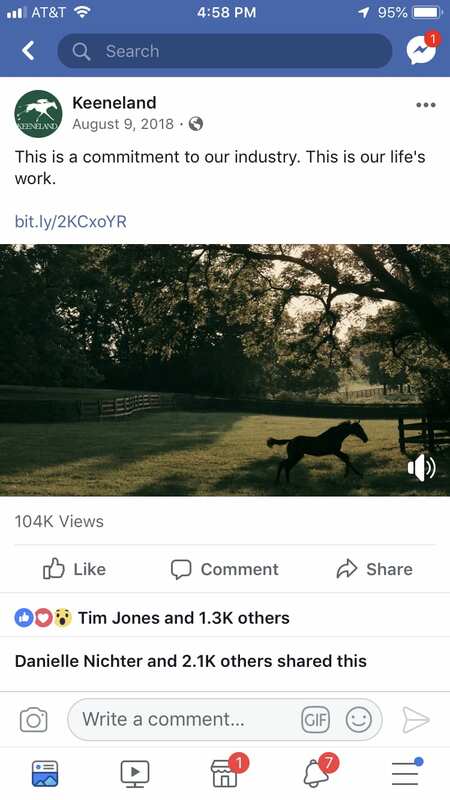 With more than 365,000 people reached and 212,000 views across social platforms, plus nearly 4,000 shares, the spot spread quickly through the tight-knit Thoroughbred industry and beyond, with reactions coming in from across the globe. In addition to coverage in a variety of local and industry publications, the spot was also featured in Communication Arts Magazine. The universally positive reaction to the spot has led to a continuing campaign, with short videos highlighting individuals within the industry.